In spite of the new car park charges, most of the car parks at Kingston UNiversity remain full during peak times. KU staff have slammed the University’s new policy which charges them up to £400 to park on campus. The new policy, which came into force on October 1, requires staff to pay an administrative fee for their parking permits even though that does not guarantee them a parking space. “I get here (to the Fassett Road parking space) at twenty past eight in the morning and I try and if I can’t then I have to pay so, in fact, I’m double paying because I’ve already paid for my year and then you also have to pay in the street,” said Deborah Norton, a faculty support officer at the Kingston School of Art. She said that she does not like the fact that visitors to the University can book free external visitors parking while members of staff still have to pay. “If you arrive in the morning at 8.30 in the morning you can’t park because security has blocked them (parking spaces) off for visitors and they may only be coming in for a couple of hours and they don’t pay and that I think is mad,” Norton said. The administrative fees for an annual permit are based on staff’s salaries and range from £100 to £400. This allows them to park in any of the car parks in the different campuses across the University and move between sites using the free inter-site bus. Another member of staff from the Business School said: “I don’t mind paying a parking charge, but I do think it’s quite a lot of money and I think it’s pretty unfair that it’s stepped. “I had a bit of a fight, a battle on with them because they were going to charge me a full year and I’m going on maternity leave in six weeks and they weren’t going to give me any refund… but eventually, they gave me a prerogative,” she said. Ronald Ranta, a senior lecturer in International Relations and Politics and commuter from Brighton, said that unless staff work at the University for more than three days a week, paying the administrative fee was not worth it. A special type of permit for part-time staff, as well as three-month car parking permits, were also developed in response to feedback and are available for staff. Students, motorcycle riders and holders of a blue badge to accessible parking will still need to apply for a parking permit in the new system, but this will be free for them. 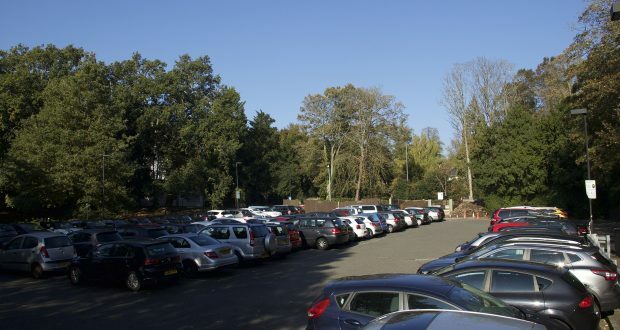 However, only students with courses based at Kingston Hill, excluding joint courses with other campuses, can obtain a parking permit to park on that campus. Students who study at other campuses will no longer be able to park at Kingston Hill. This is the first time that a parking charge has been done on a paperless manner and Tim, a member of the reception staff at Kingston Hill, said that this has caused confusion among staff and students. “Ninety per cent of what we deal with at reception these days is parking related,” he said. The University decided to introduce these administrative fees for staff parking permits in December 2017 and has said that the fee was introduced to make the parking service a ‘cost-neutral’ one. In that way, the money collected from the fees will be used to cover the cost of administration of car parking and security. “The University is legally required to reduce carbon emissions from commuting and business travel. The majority of universities across the country charge a range of parking fees for staff, students and external visitors,” a University spokesperson said. “In line with this, and as part of the University’s Travel Plan, which aims to encourage students and staff to make sustainable travel choices, the Senior Leadership Team last year decided to introduce an administrative fee for staff parking permits,” they added. At October 5 this year there were 800 applications for staff parking permits, compared to 1,091 on October 5 2017, a drop of 27 per cent. This means that if the average annual parking fee was £150, KU would earn £120 000 from the administrative fees.